Integrate Salesforce, Evernote, Basecamp, Google Drive, SharePoint, and other apps with Egnyte. Have access to Salesforce, Evernote, Basecamp, SharePoint and other apps via your Egnyte .. 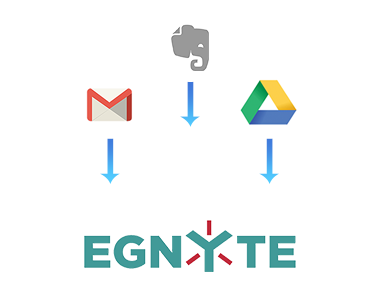 Integrate other cloud platforms such as Google Drive and Gmail, Dropbox Business, Office365 with Egnyte. Aggregate and consolidate all your cloud apps. No data will be lost. Everything will be under your control, backed up in your Egnyte.